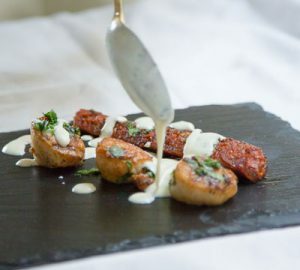 Theodore’s recipe is a novel and simply delicious idea using our Greek style vanilla yogurt. Easy to prepare and superb to savour. 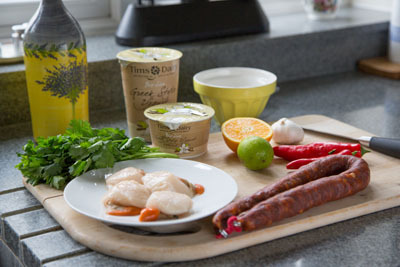 In a medium bowl, whisk together 3 tbsp olive oil, orange juice, yogurt, tarragon, salt and pepper. Set dressing aside. Heat the butter and 1 tbsp olive oil in a frying pan over a medium heat. Add the chorizo and cook, tossing until it starts to brown, about 1 minute. 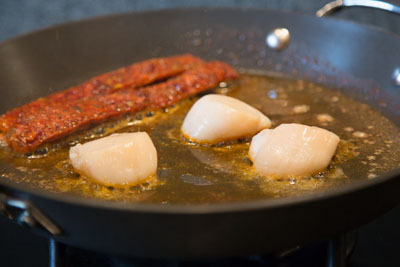 Add the scallops and sear them for about 1 min until golden, then flip them over and sprinkle over the garlic and chopped fresh red chilli into the pan. Cook for about 1 min more, then squeeze over the juice of the lime. Finish off with roughly chopped coriander and salt and pepper. 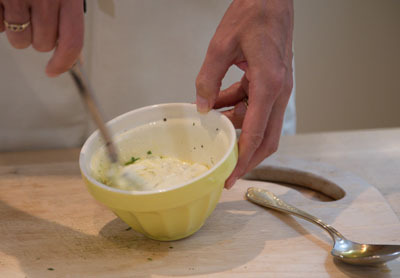 Drizzle over the vanilla yogurt dressing and serve straight away. Warm sourdough baguette will help soak up all the surrounding juices!